Elizabeth Warren is the surrogate he was supposed to be. His supporters have become Clinton’s. How Sanders overplayed his hand. 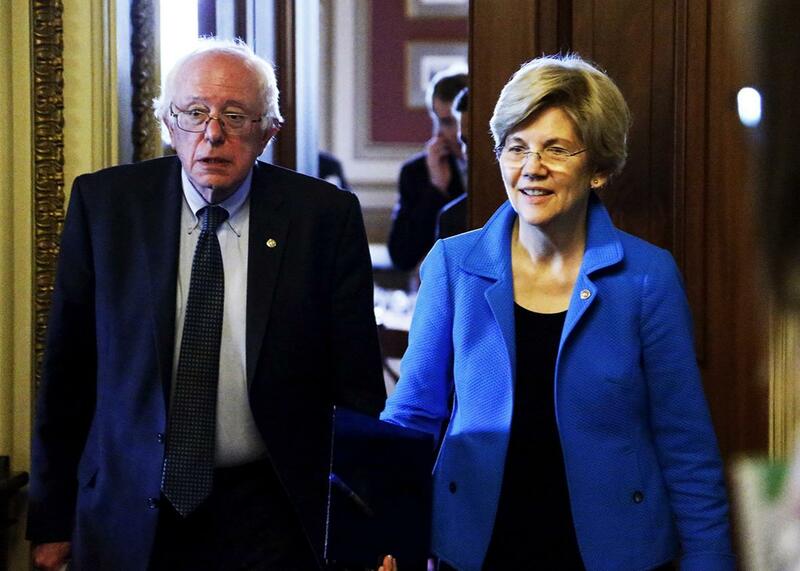 Sen. Bernie Sanders and Sen. Elizabeth Warren at the U.S. Capitol in May 2015. On Monday, Hillary Clinton and Elizabeth Warren campaigned together in Cincinnati. Their message was clear: Donald Trump is a “thin-skinned bully who is driven by greed and hate,” as Warren put it, and the Democratic Party can deliver the policies and investments to improve life for ordinary Americans. But more interesting than their rhetoric was the event’s tone and tenor. Warren was a compelling surrogate, giving Clinton the kind of strong and affirmative endorsement she needs to win over skeptical voters. And Clinton, in turn, was energized, touting her policies and platform—and indicting Trump for his attitudes and behavior. It was a grand display of party unity: Warren and Clinton, the left and the center-left, united against a common foe and cheered on by thousands of excited Democrats, all ready for the general election. And where was Bernie Sanders? Two weeks ago, after the Democratic primary’s official end, the Vermont senator gave a campaign speech that had all the trappings of a concession but lacked the part where he actually conceded. In it, he celebrated the size, scope, and success of his insurgent bid, spoke a little about cooperation with Clinton, and went on to affirm his efforts to reform the Democratic Party. In the most recent poll from ABC News and the Washington Post, Clinton leads Trump 51 percent to 39 percent, expanding her previous lead by 5 points, as Trump has seen a complete collapse in his support. And what’s driving the move toward Clinton? Democrats and independents who supported Bernie Sanders. In May, 20 percent of Sanders supporters said they would back Trump over Clinton in the general election. In June, that number is down to 8 percent. Overall, 81 percent of Sanders backers have rallied to Clinton, surpassing the 74 percent of Clinton supporters in 2008 who fell in behind Barack Obama. By any measure, the Democratic Party is unified. Sanders’ endorsement isn’t irrelevant, but it now carries less weight, and the leverage he held at the end of the primary just isn’t there anymore. Take the Democratic platform. The good news for Team Sanders is that its advocates—like Minnesota Rep. Keith Ellison—have put Social Security expansion and the $15-an-hour minimum wage into the party document, as well as a call for an “updated and modernized version of Glass-Steagall,” the Depression-era law that prohibited commercial banks from engaging in investment banking activities. At the same time, these are areas of wide Democratic agreement. Most Democrats support Social Security expansion and a substantially higher minimum wage, up to and including $15-an-hour. These aren’t concessions. On those points that are more contentious, Team Sanders has lost out. The platform committee has rejected Sanders’ language on the Israeli–Palestinian conflict, his stance against the Trans-Pacific Partnership, his call for a carbon tax, and his total opposition to fracking. Maybe this was inevitable. Maybe Sanders was never going to have the full stamp he clamored for simply on account of having lost. But this underplays the initial strength of his hand. Had Sanders endorsed Clinton at the end of the primaries and recalibrated as an advocate for her campaign—in short, had he mimicked Warren—he would have gotten ahead of his voters. This is important. With an early concession and endorsement, Sanders does two things: He pre-empts any natural movement to Clinton among Democratic primary voters, which lets him claim credit for her improved numbers even if they were inevitable. Like Warren, he would take a starring role in the campaign against Trump. And as we saw in 2008 between Obama and Clinton, a partnership can open the doors to lasting influence. As it stands, the Vermont senator has almost vanished from the news cycle, overshadowed by Clinton’s growing lead, overall Democratic unity, global events, and the never-ending emissions of Donald Trump. He’ll still matter to the shape and direction of the Democratic National Convention, but he could have had a larger, more visible role. Bernie Sanders had his shot, and he threw it away.